Freesia flowers convey a variety of meanings, including friendship, innocence, thoughtfulness, perseverance and being high-spirited. In the language of flowers, freesias were traditionally used to convey friendship. Contemporary florists, noting its graceful appearance, recommend freesia for someone who is graceful under pressure. Freesias are grown for cut flowers and scented oil. In the language of flowers, yellow freesias connote friendship while white freesias mean innocence. Freesia is a symbol for multiple sentiments. The traditional yellow flower is said to mainly signify friendship while the white freesia is used as an expression of innocence, according to Teleflora.com. 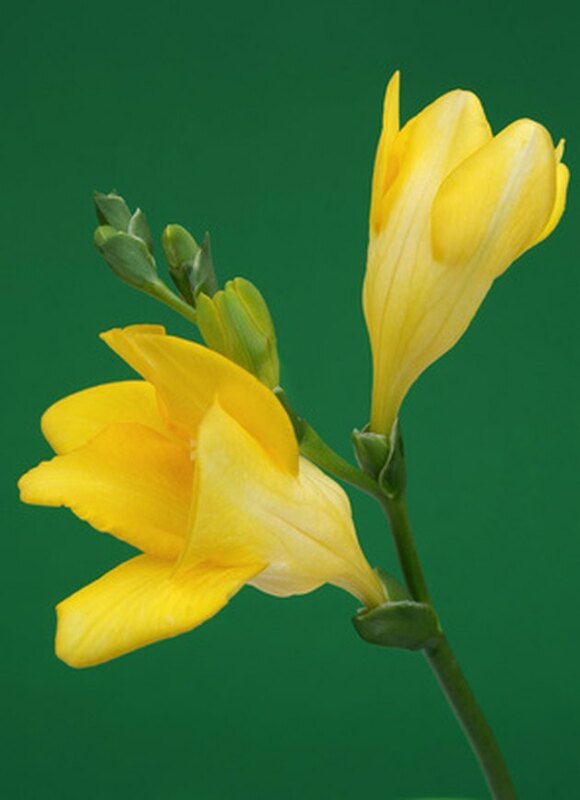 The bell-shaped flower with an almost citrus fragrance comes in a variety of colors, but specific meanings are only attached to the white or yellow freesias. The long-lasting cut flower has become a common addition to contemporary floral bouquets. Using flowers as a language to convey feelings, known as floriagraphy, peaked in the Victorian Era of the 19th Century, when polite society did not speak of emotions and writers, especially women writers, attached secret meanings to flowers and plants. Many flowers, including roses, iris, carnations and lilies, had multiple meanings depending on their color and how they were arranged or presented. Freesias are native to Africa with 14 of its species growing wild in South Africa and two native to the Sudan and Saharan Africa. Freesias were not cultivated until 1878, but created a sensation in Victorian England, France and the United States after their introduction, according to The Flower Expert. Some varieties have naturalized in coastal areas of California, but freesias generally are difficult to grow in the United States other than in commercial greenhouse settings. 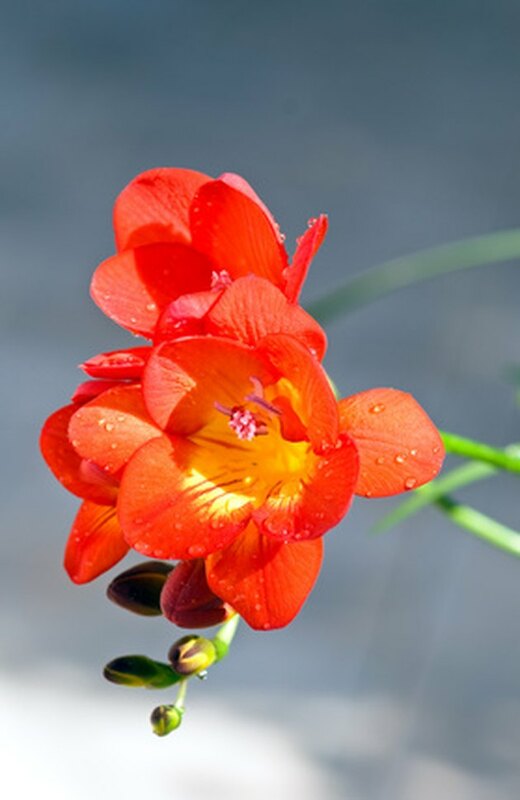 The freesia is named after German physician Friedrich Heinrich Theodor Freese, according to Teleflora.com. White freesias are considered the most fragrant, but the flower can be found in variations of yellow, orange, red, purple, mauve and pink, as well as striped varieties of each color. The bright flowers blossom along one side of the plant's stem, a pattern known as "zygomorpic." While the buds are produced facing downward, the stem bends as the flowers mature so that the blossoms end up facing upward. Each long stem produces up to 10 flowers with little foliage, according to About Flowers. Cut freesias will last up to 14 days. Freesias are the traditional flower for a seventh wedding anniversary. Their graceful appearance has led some florists to recommend bouquets of freesia be given to thank someone for performing gracefully under pressure. In addition to being used as cut flowers, freesia flowers are grown for their scented oil, which is used in perfumes, bath oils, soaps and lotions, according to The Flower Expert. 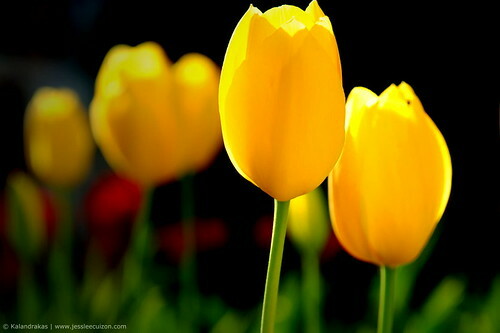 What Do Yellow Tulips Mean?